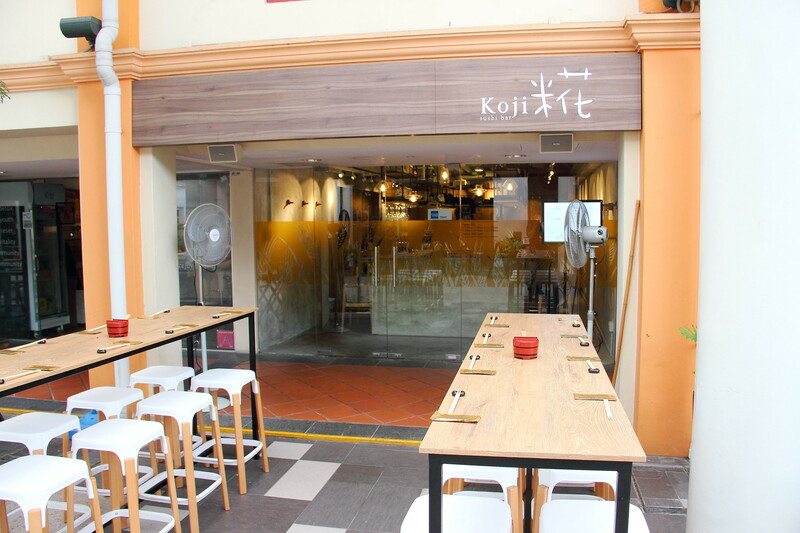 A two month's old Japanese restaurant, Koji (米花) Sushi Bar has opened its door directly opposite Hinoki Japanese Restaurant at China Square Central. 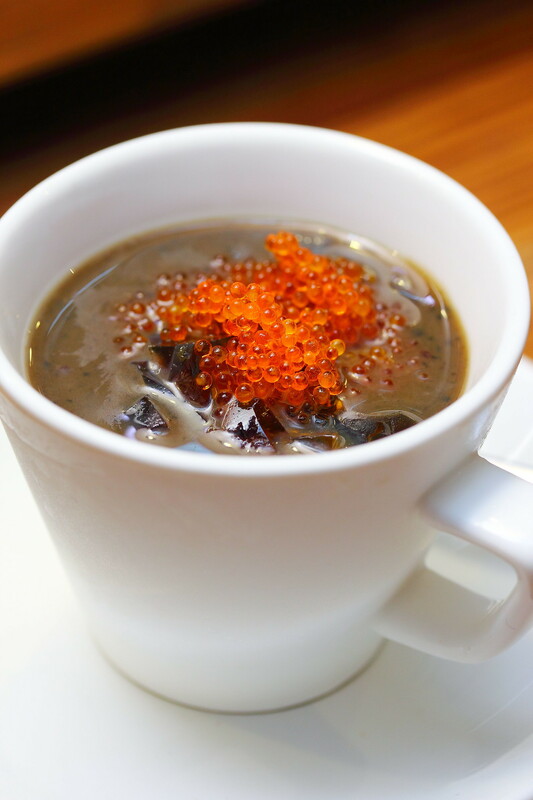 Koji Sushi Bar is a trendy and casual sushi/sashimi joint lead by Chef Benny. Stepping into the little restaurant, it resembles those sushi bar in Japan with counter seats surrounding the chef and barely any walking space. For a more comfort personal space, there are high tables and benches outdoor. My lunch at Koji Sushi Bar started with the Pitan Tofu. I love this cold starter. I thought this is a brilliant combination since the first time I had it many many years ago. Back then I was like, wow I didn't know Japanese use century egg in their cuisine. All the while I thought century egg is only used in Chinese cuisine. Next up is a platter of trio. 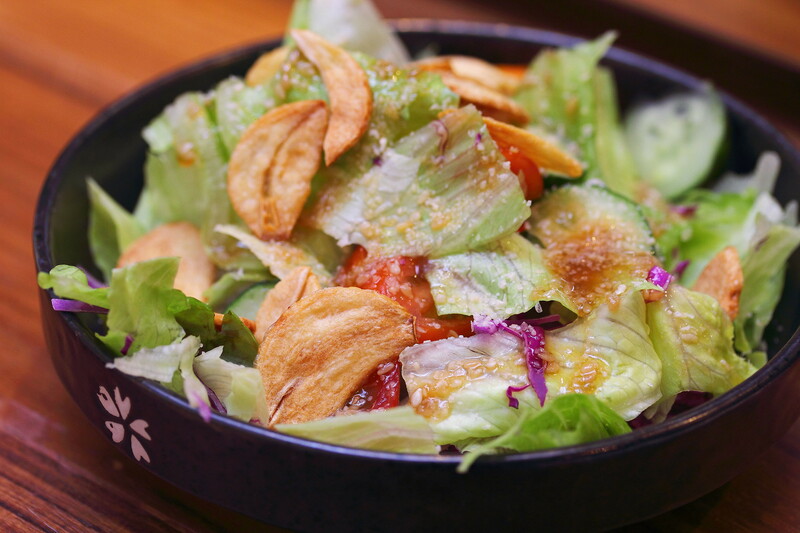 On the plate is Salmon tossed in a flavourful marinade and topped with sesame. The combination delivered a rich flavour to the salmon and bursting aroma with each bite of the sesame, giving it a new lease of life. Following that is Crab meat with seaweed in a yuzu sauce. This was light and refreshing which in a way helped to clear the palate after the rich flavour from the salmon. Lastly is Amberjack sashimi with truffle. A very clean taste which is further accentuated by the earthy truffle aroma. The Silver Bait Fish in Ponzu Sauce is next. I did not quite enjoy this dish as there was a bitter aftertaste with the fish. I could not really made up what caused it but I suspect it could come from the eyes of the silver bait fish. A simple Salad dish build up to the highlights. Fried garlic was added to the salad which I thought was rather interesting. Initially I found it quite bitter but as I had more, I started to appreciate the thought behind it. 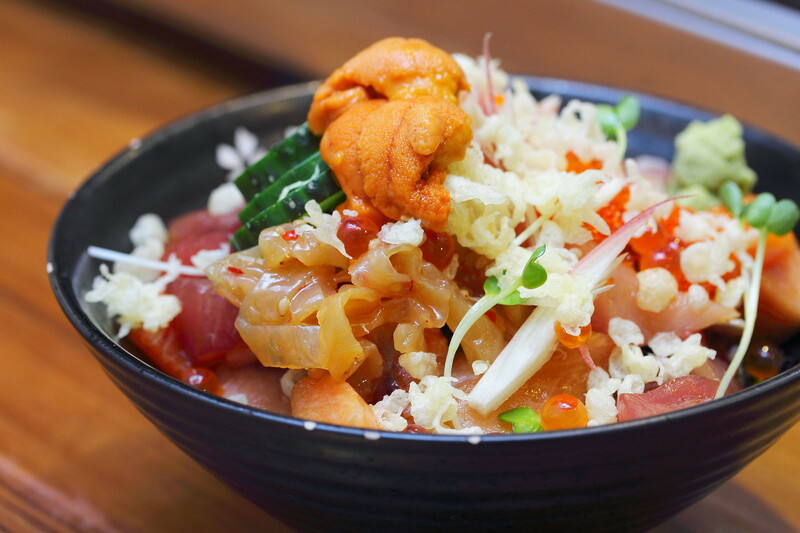 One of the highlights at Koji Sushi Bar is the Chirashi Don ($17), add Uni ($8) to complete the generous servicing. This bowl of sashimi rice is further topped with tempura crumble to give it the extra texture. The crunchy jelly fish strips further added another layer of texture. For the money, I would say this is probably the best value chirashi don in town. 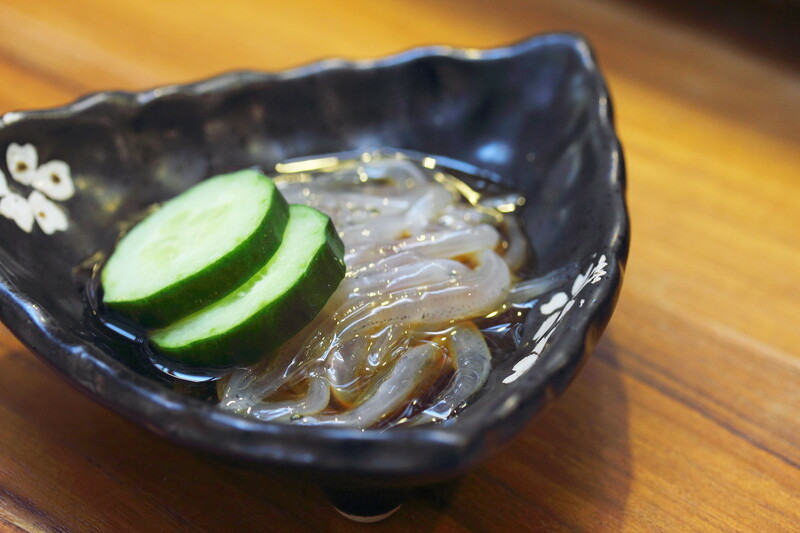 The Clear Hamaguri Clam Soup was served at the most appropriate timing after the chirashi don. 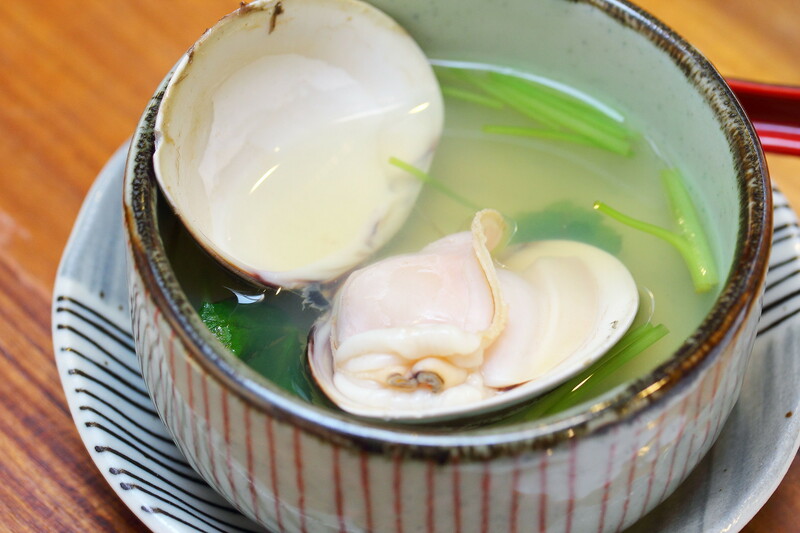 The light but yet natural flavoured soup from the sweetness of the hamaguri clam helped to wash down all the greasiness and cleared the palate. It is also perfect after having a couple of drinks. It will freshened up and cleansed the intoxication. Last but not least is the Wagyu Sukiyaki ($25). Koji Sushi Bar uses marble seven wagyu beef for the sukiyaki. 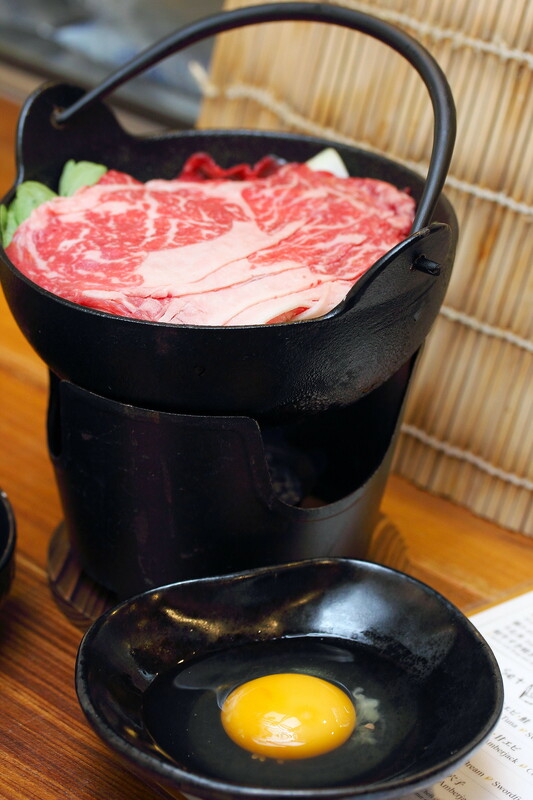 The beautiful marbling and melted in the mouth beef was simplicity at its best with the sukiyaki allowing one to appreciate the natural flavour of the beef to the fullest. Koji Sushi Bar maybe a casual setup but quality and freshness is not compromised. Fresh seafood delivery is made 3 times a week. 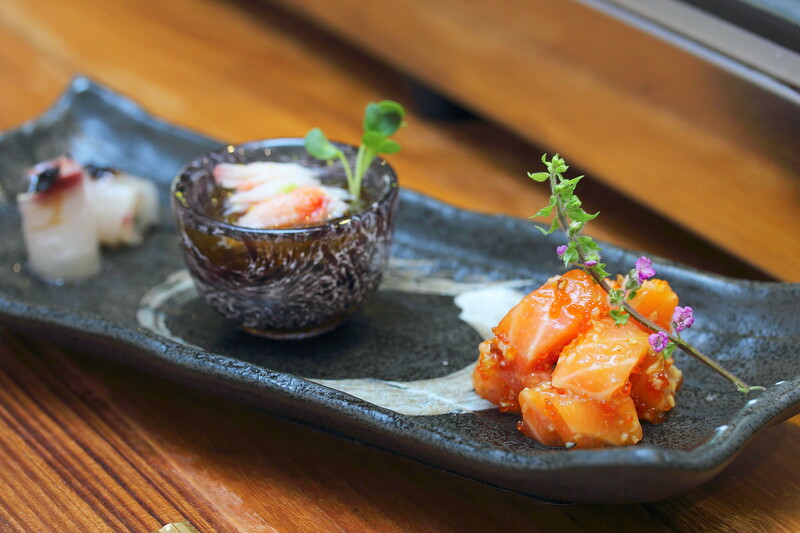 It also offers omakase dinner starting from $85. However advance reservation is needed for the omakase dinner.